Versatility is the name of the game for an all terrain pram when you’re in the throes of preparing for and naming your new baby. Gear that lasts through multiple age groups and meets your needs from birth to preschooler becomes a must-have, and while the prices for such durable, flexible baby gear items is slightly more expensive, the cost is completely justified. That’s why, when a mid-priced stroller that grows with you child comes on the market, it deserves a fair, honest look. Since, to be honest, not every stroller or piece of baby gear deserves a second look. The Roan Rocco Classic Pram Stroller 2-in-1 with bassinet and seat unit, though, is one you’ll definitely want to check out for your little one. The large bassinet base — more than 31 inches long and more than 14 inches wide — gives your newborn plenty of space to stretch out on a flat surface, which is the best way for babies to sleep. It’s easily removable from the frame and includes carrying handles, as well as a mattress and cover to keep baby comfortable and warm. Roan Rocco has made the stroller comfortable for parents, as well, with a height-adjustable handlebar, large fixed wheels, and a spacious undercarriage storage basket. Unlike other top-of-the-line strollers where any attachments, seats, or components need to be bought separately, the Roan Rocco Classic Pram Stroller 2-in-1 comes with everything you need for operation, including the chassis with wheels, the bassinet, which comes with its own mattress and all-weather cover, the seat, which comes with a cover, a side cover, an adjustable, ventilation-available hood that can be used with either the bassinet or seat, and a coordinating diaper bag. The stroller is extremely easy to assemble, and goes together in a matter of minutes. It’s also easy to collapse and expand when you need to travel with the pram. The customer service is outstanding, and the representatives really go above and beyond to make sure their customers are pleased. The design allows parents to gently rock the stroller without having to push the entire stroller back and forth. It can also rock side-to-side, which many babies find soothing. Q: Is this really an all terrain pram? A: Users have taken the stroller in grassy parks, snow-filled roads, and even sandy beaches with no problems steering. Some found that they had more difficulty pushing the stroller through extremely deep snow, and, like most strollers, had to do slightly more work to push the stroller on the beach. On a firm, sandy road, though, parents had no problems pushing their children. Q: How hard is the stroller to steer with fixed wheels? A: Like most other strollers with fixed wheels, you might find that turning sharp corners is slightly more challenging and requires you to pop the front or back wheels if you need to turn. 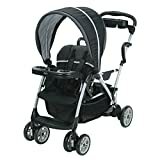 The benefit of the wheels is that they make for a very easy-to-steer stroller that can handle most terrains with ease while still giving excellent stability. Q: Is this stroller very durable? A: Parents rave about the size and strength of this stroller. Even though it has a much larger frame, it’s extremely strong and very comfortable. It’s well-designed and sturdy enough for any child. The stroller is extremely solid, from the chassis frame to the metal undercarriage basket. Parents appreciate knowing that the construction has taken into account larger seats that give children more comfort. The all-weather cover is one of the best on the market, as it completely covers the seat or bassinet while still allowing for fresh air. Unlike other protective covers that barely cover the child’s seat, Roan Rocco has created a very user-friendly option. This all terrain pram has a suspension system that keeps children from feeling the effects of rough terrain — which is ideal for babies sleeping on their backs. The front wheels don’t swivel. That makes maneuverability much more challenging than many parents would like for a stroller. The stroller is much larger than many others. It’s hard to push through tight store aisles, crowded sidewalks, or to fold up and put in a car trunk. Quite a few parents have found that after a few months of use, the wheels and suspension start to creak. While it easily clears up with a little oil, it’s not something most parents want to deal with after such a short period of usage. It’s significantly more than some travel systems, so it might not be within the price range for some households. All in all, the Roan Rocco Classic Pram Stroller 2-in-1 with the Bassinet and Seat Unit is a top pick. The stroller offers a great deal of flexibility, with the included bassinet and the seat that can be turned to face in or out. From the color options and large undercarriage basket to the height-adjustable handlebar, the company has worked to create a highly detailed stroller that meets the needs of all parents. If you’re able to look past the fixed wheels and can fit the stroller in your budget, this will be the stroller you’ll love to use on a daily basis. Not the best all terrain pram for your needs? Head over to our stroller reviews page for more selections!